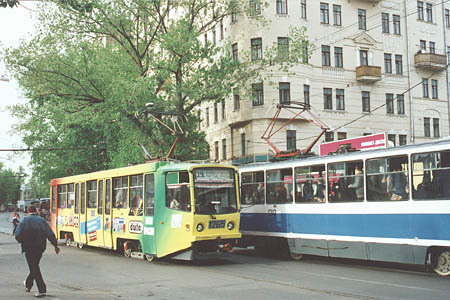 The tram line along Novokuznetskaya Street is one of the oldest survived lines in Moscow. The operation of electric tram here was begun in 1909. The line links the Boulevard line with the main tram network. Routes 3, 39 and A serve the line, and although the regularity of service is far from perfect because of permanent problems with motorists in busy crossings along the line, it is highly popular. 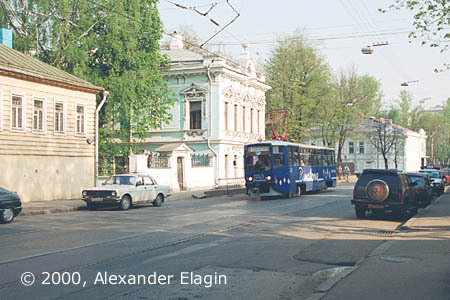 The crossroad of Novokuznetskaya Street and Klimentovskiy Pereulok. Until the beginning of 1960's, there was a left turn towards Pyatnitskaya Street in this place; afterwards the alignment was changed and tracks were laid in a newly cut along the newly cut Sadovnicheskiy Proyezd to the bridge across the Vodootvodniy Channel (the arm of Moskva River). The old line in Pyatnitskaya was closed, of course. Novokuznetskaya street still keeps the look of old Moscow, with nice old mansions and green trees, though there are many modern buildings here, too. 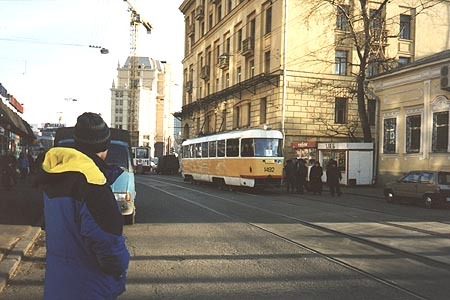 The tram line, having passed along Novokuznetskaya street, crosses the Sadovoye Koltso (the Garden Ring around the centre of Moscow; no gardens are there nowadays, this is a great motorway with very heavy traffic...) and goes southwards. This is the only tram crossing of the Sadovoye that still survives. The building under construction is on the other side of the highway; it stands at the junction of Dubininskaya Street with Sadovoye, where the line continues.